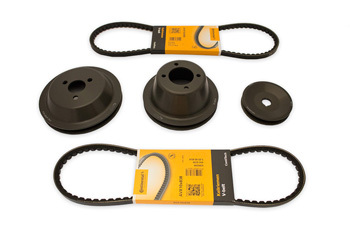 The VAC S14 Underdrive Power Pulley Set is better than ever. Always made using only virgin billet aluminum, a hard anodized finish, and the tightest tolerances, our pulley sets are used on some of the fastest S14s on the planet. This lightweight design optimizes performance and response while under-driving components just the right amount for proper function. The more power and RPM your S14 makes, the more gain you can see. Perfect for track cars, they can also be used on a street car without any problems. The tolerances on all our components are manufactured down to the thousandths of an inch. These pulleys come close to contact with some other engine components but will not touch, this is completely normal.